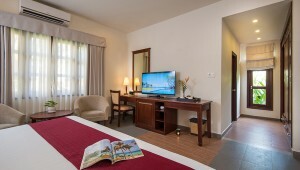 Your vacation is more memorable than ever with ocean or garden view Deluxe room; finely decored with facilities included bathtub; tea, coffee and fresh water; high speed wireless internet; and healthy scale. Especially, private balcony is a great place to enjoy unique views. 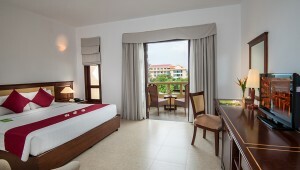 Grand Deluxe room boasts our best views of either the ocean or our gardens making it a great choice for your family. 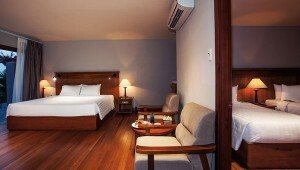 It is located in Grand building, well-equipped with individual restaurant and swimming pool. Private bungalow overlooked to the ocean or nested in our stunning garden is the perfect for your vacation. 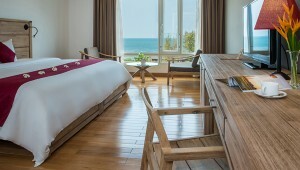 Relaxing in your beach chairs with tropical cocktails and falling asleep lulled by the sound of tranquil surf. Amenities include healthy scale, bathrobe, bathtube, wooden floor, in-house movies, and 42-inch satellite TV.